Many of the books on my shelves were discovered in this wonderful wooden shed on Palace Gardens Terrace. On fine days there would be a table outside laid with small appetisers to tempt me inside, where I would be greeted with a friendly smile and an eclectic selection of books. It was always a welcome antidote to the prescribed choice found at Waterstones. But it’s been closed since the end of last summer. After months of wondering if it would ever reopen, suddenly the window is empty. A closer look inside reveals shelves stripped bare and all contents removed. I hear that Sheila, who ran the shop since it opened 45 years ago, has suffered a stroke. She is said to be in a nursing home where a rota of friends and loyal customers visit to read her short stories which she adores. In 2008, when the neighbouring Czech Embassy wanted the land for a visa centre, supporters successfully campaigned to keep the bookshop open. Sheila was quoted as saying: ‘Customers have told me they will be really upset if I go’. This shop is a treasure. I’ve been buying here since I was a student in the late 60’s. The owner, Sheila Ramage, is quite the nicest person I’ve ever bought books from in 40 years of collecting. The Art, Architecture and Design section is outstanding. I never leave this shop without more than I can carry and it’s such a pleasure to browse in such a welcoming and compact store. – Phil Beard, alias buttes-chaumont. 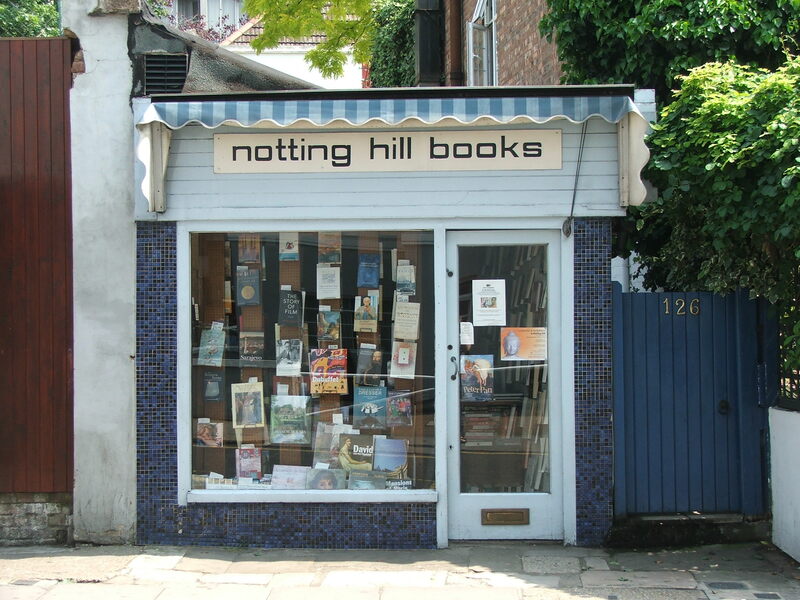 Notting Hill Books… known by those who frequent it as “Sheila’s shop” …run by the friendly and incredibly knowledgeable Sheila Ramage… Warning: this is NOT where they made the film, but this is the original Notting Hill bookshop…. and it is a true bookworm’s paradise, a long thin cavern of a shop, crammed with an amazing range of second-hand books. If you haven’t been to this one then you haven’t been to the best bookstore in London. – Keeli, commenting on the Guardian’s Book Blog. PS: Since writing this post last year I’ve been in touch with Charles Boyle, publisher of CB editions, who has also written about Sheila and Notting Hill Books on his blog – see it here at Sonofabook. 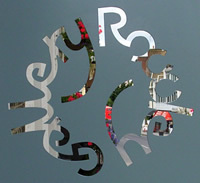 This entry was posted in Books, Sheds and tagged Notting Hill Books, Notting Hill Gate, Sheila Ramage. Bookmark the permalink. Oh dear this is so sad. I do hope she recovers fully and spends her retirement in comfort. I loved popping into this shop whenever I was in the neighbourhood. I had hoped that when i recently walked past it and saw that it was a bit shabby with the tell-tale piles of envelopes at the foot of the door, that this was just a temporary condition. But now I know I’ll not be popping in I feel very sad for the bookshop and, of course, Sheila. I didn’t know Sheila personally but she was such a friendly bookseller and often rounded down the totals whenever I bought several books. I knew her name, because one would be browsing when a friend/acquaintance/regular customer came in and they’d engage in a chat which one could not avoid overhearing. I loved the smell her paraffin heaters radiated as they worked away to keep what was, at heart, a damp outhouse warm and dry. Sadly this type of bookshop is a thing of the past. I miss Sheila Ramage very much too – with a friend we used to visit her in Notting Hill Books ( and bought lovely books) right up to the time she had her stroke. Then we found her brother at ‘the seat of custom’ and then sadly saw all her stock disappear – both damp and not-damp. It appeared that the damp had come in from the Ark, the restaurant next door. I have been sending in cards, notes and letters in the hope they might reach her. She is an exceptional person, and bookseller. In the early sixties I worked for a male counterpart at the Church Street Bookshop – Ken Fyfe- which is now Octavia Housing charity shop..If this is seen by the framer at the Rowley Gallery, I could mention I went on to sell art works, mostly using old watch parts, at the Chelsea Open Art Exhibition, and work in galleries and a framer in Elystan Street. May Sheila still flourish. EF. I discovered this bookshop in 1970 and whenever I was in this part of London I dropped in for a browse. I rarely went off without a book or two. Sheila was lovely, always greeting you with a smile, never hurrying. She loved books and she was kind to her customers. I have passed the closed-up shop several times in the last year or so and was worried. I am sorry to hear that she has been ill and I hope she is recovering. May Sheila have a long retirement in which she has time to read some books. I will miss her and her little bookshop. 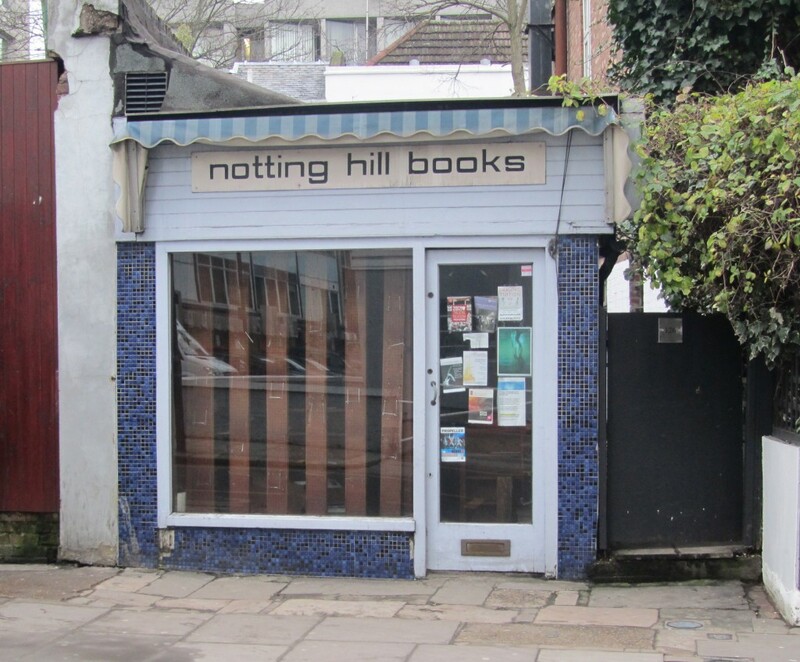 For me Notting Hill will never be the same again. Hi – have you an update on Sheila? I notice all the comments are from this time last year. I occasionally worked for Sheila when I was a student at the RCA and like all your other posts I found her a lovely, experienced, generous woman and best of all a ‘boss’ with a great sense of humour. If you can get word to her that I send my love and wish her well it would be appreciated. I’m so sad to hear about Sheila. I wondered what had happened when I last went round and saw the shop closed. I first went in to Notting Hill Books with my father when I was a boy, not long after she opened in 1968 I think it was. We lived only a few minutes away and I spent so many happy hours in the shop, browsing and chatting to Sheila. She has such a wonderful personality and sense of humour and knows or knew so many writers and interesting people. I would love to visit her, so if anyone knows the address of the Home in which she is living, I would be grateful if you could pass it on to me. Many thanks. Richard Challoner. This is close to two years since the last posting. I wonder what has happened to Sheila since. I first encountered her in 1977 when I was a student at Studio 68 of Theatre Arts which then held classes and performances a few doors up the street at the Unitarian Church. At the time, Sheila shared the shop with a colleague, Pam who left eventually, Sheila seemed a permanent fixture until she had her stroke. The shop is still there, standing empty, waiting. I guess that’s a good sign.